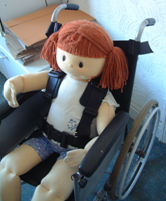 All of our belts and harnesses are designed to fit on the various types of wheelchairs supplied by the N.H.S. and most other wheelchairs, manual or power driven. 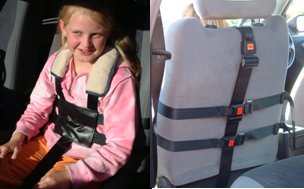 When choosing a belt or harness for patients who tend to slip down in the seat, are severely disabled, suffer from blackouts, convulsions or involuntary movements, we strongly recommend harnesses fitted with crotch straps or with a strap across the thighs. 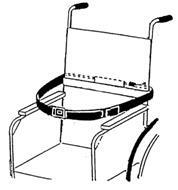 The object of the added strap is to prevent the patient slipping down and out of the chair seat, and to ensure the harness straps are kept clear of the patient’s neck and face. A full supportive wheelchair harness. Consists of waist belt, shoulder straps and under strap/groin strap. Designed to hold the patient in an upright sitting position. Same design as Model 1 but smaller for children's wheelchairs. 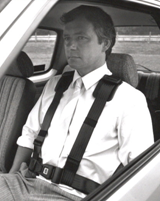 Fully rear fastening vehicle harness. 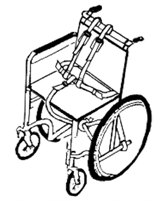 The wheelchair version is fitted with three lightweight Side Squeeze Buckles. This model has the advantage of being sold in separate components. Depending on the individual requirements of the user, Model 14 can start from a simple pelvic belt and be transformed into a fully supportive harness by adding shoulder straps and/or a groin strap as and when required. 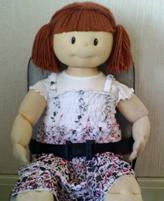 If the wheelchair already has a waist belt, shoulder straps can be added to offer additional support. Consequently all parts of this harness are detachable. Upgraded version of the full 5 point, Model 14 harness. The shoulder straps are sewn into a fixed position on either side of the belt buckle for extra stability. Only the groin strap is detachable. 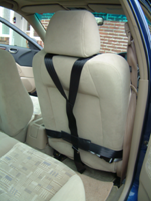 Single vehicle seat harness that can also be used on wheelchairs, scooters & stair lifts. Front fastening harness, consisting of waist belt and shoulder straps. (the under strap is optional). Consists of a waist belt with an inner chair attachment strap. Holds the occupant in a wheelchair, easy chair, scooter or single vehicle seat.